Yeah, you might have just graduated from college and have all the knowledge in the world, but before you’re so sure you’re always right, humbly realize that experience is what makes that knowledge worth anything. The image is from cartoonist Hugh MacLeod, who came up with such a brilliant way to express a concept that’s often not that easy to grasp. The image makes a clear point—that knowledge alone is not useful unless we can make connections between what we know. 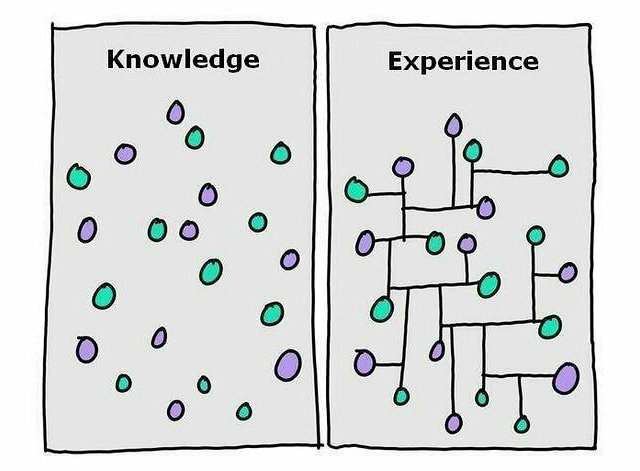 Whether you use the terms “knowledge” and “experience” to explain the difference or not, the concept itself is sound.